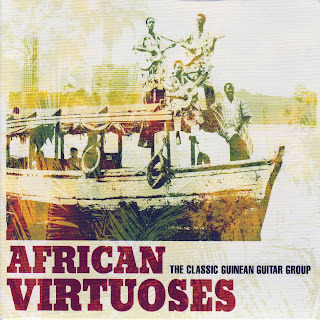 Today’s FREE MP3 is a taste of African guitar virtuosity. Matter fact, the group is called African Virtuoses. As per the Francophone spelling of “virtuosos,” the group is from Guinea. It features three brothers from the Diabaté family... traditional kora masters who decided to take up the guitar. Click here to hear “Toubaka” on my Vox blog. This track is from a 1983 album that was re-released two years ago to international acclaim. yeah, they live up to the title.